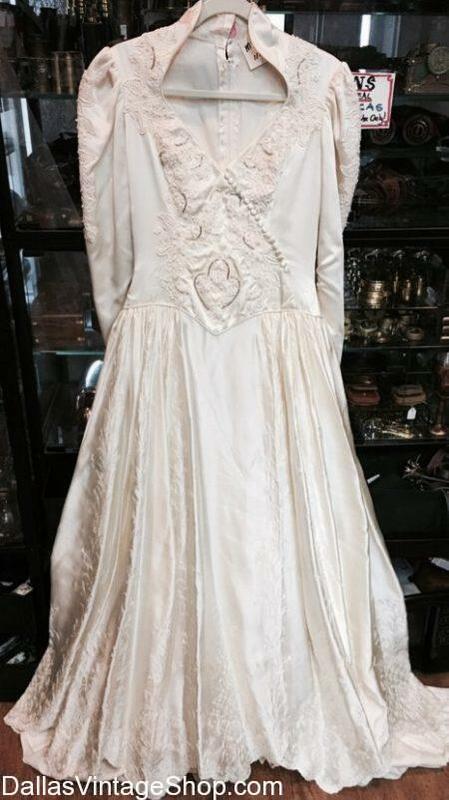 We have Vintage Wedding Dresses, Economy Wedding Gowns and Themed Wedding Gowns for Vintage Wedding Themes. Get Vintage Wedding Dresses in many, many Styles & Periods and we have Vintage Wedding Veils too. Here are the most popular Wedding Themed Dresses we commonly sell: 70’s & 80’s Wedding Dresses, Old West Wedding Dresses, Prairie Style Wedding Dresses, Victorian Wedding Dresses, Steampunk Wedding Dresses, 20’s Wedding Dresses, 30’s Wedding Dresses, 40’sWedding Dresses, 50’s Wedding Dresses, Prairie Wedding Dresses, Goth Wedding Dresses, Boho Wedding Dresses, Hippie Wedding Dresses, Gunny Sack wedding Dresses and many more Wedding Dresses that we have chosen because of their Iconic Features for Wedding Dresses throughout the Decades & Centuries or because of their Unique Stereotype Wedding Fashion Values. From Bazaar Wedding Dresses to Plain Jane and “What were they thinking?” Wedding Dresses. We have Elaborate Wedding Gowns worth much more than we would ever expect to get to more “Justice of the Peace” and “Shotgun Wedding” Dresses. We even have Hoochie Mama Wedding Dresses and Trailer Trash Wedding Dresses. Get all the Wedding Dress Accessories to match your Wedding Theme. Our prices for Vintage Wedding Dresses range from Supreme Quality Elaborate and Elegant Wedding Dress Styles to Median Priced Wedding Dresses. BUT REMEMBER, we also have a ton of Vintage Priced Wedding Dresses that are cheap enough to be perfect for Day of the Dead Wedding Attire, Zombie Wedding Dress Costumes, Bride of Chucky Wedding Dresses, Bride of Frankenstein Wedding Gown, Cute Sugar Skull Wedding Dresses, Ghost Brides Wedding Gowns, Scary Wedding Brides Dresses and other some Vintage Used Wedding Dresses and Wedding Costume Dresses. If you want to get really cheap Wedding Dresses you will find some that are slightly damaged or stained. We have the most Diverse and Largest Collection of Vintage Wedding Dresses in the Dallas, DFW and North Texas Area. We are open all year.